Appetizers have a very important role to play in the meal. They set the stage for the main course. They satisfy your taste buds while you still wait for the main course to arrive. Also , as many say, "The first impression is the best impression". So its really important that appetizers create an impact. 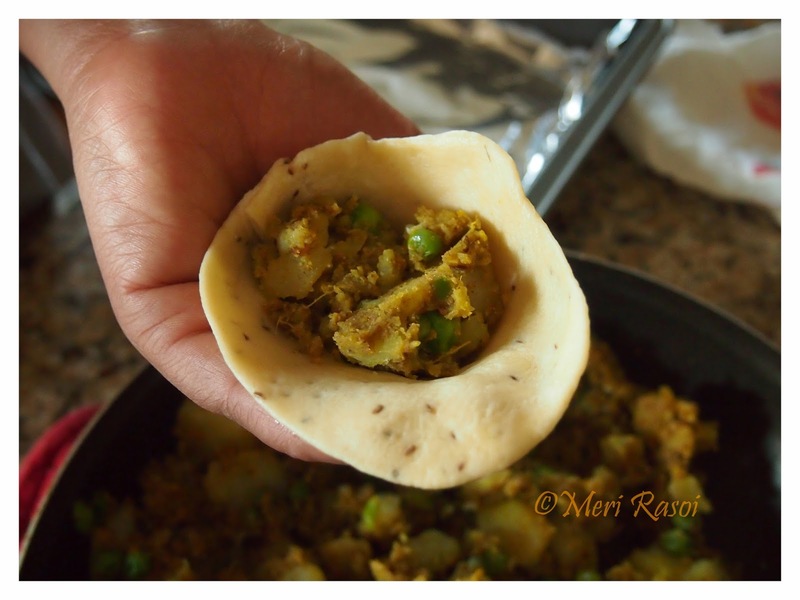 The appetizer that is always a hit is definitely our desi SAMOSA. 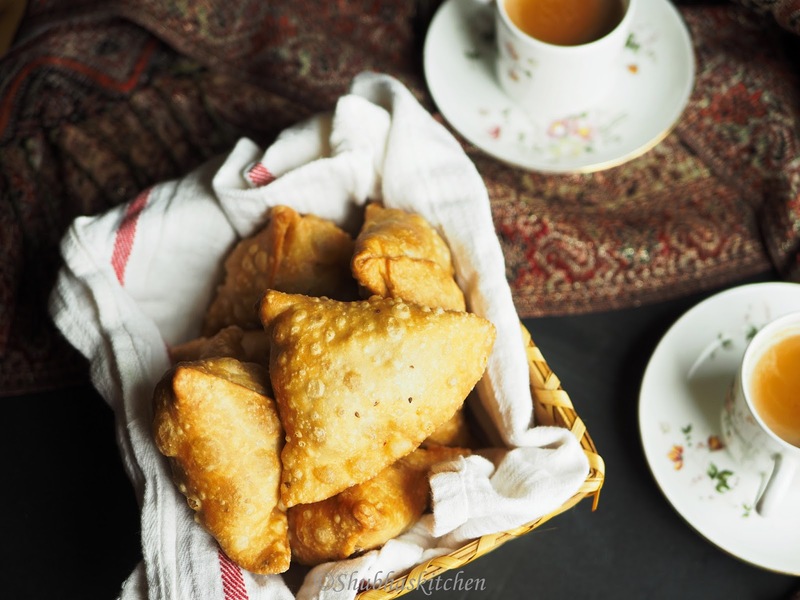 Samosa is a fried pastry with savory filling which is often served as an appetizer or snack. First , let's talk a little bit about the history of Samosa. 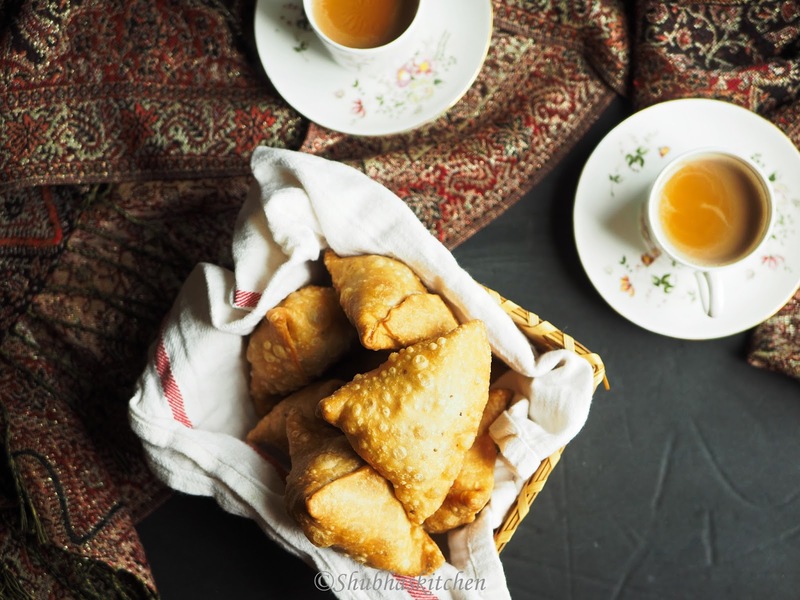 Samosas are a popular appetizer or snack in the local cuisines of Indian subcontinent, Southeast Asia, Central Asia and Southwest Asia, the Arabian Peninsula, the Mediterranean, the Horn of Africa and North Africa. 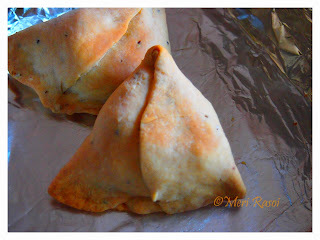 Samosa is known by different names in the different regions. 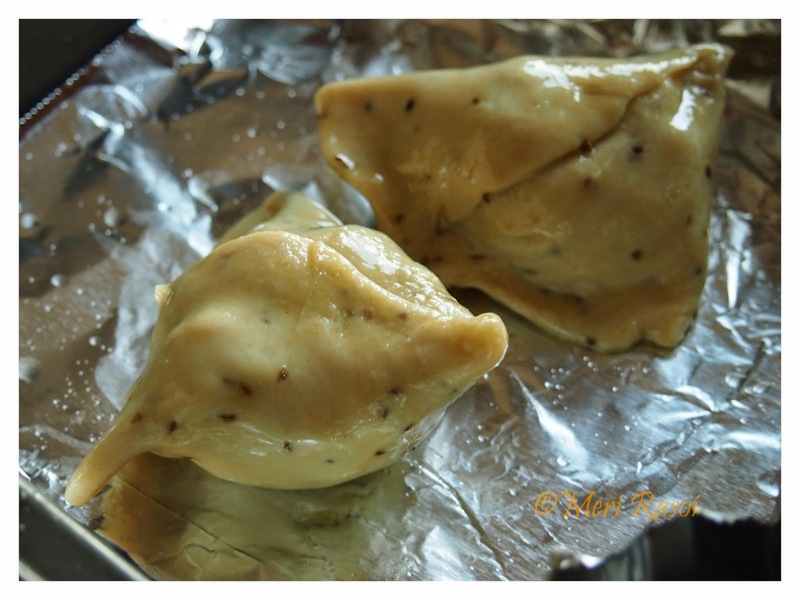 It is known by the name SAMOSA in the Indian subcontinent and South Asian countries . 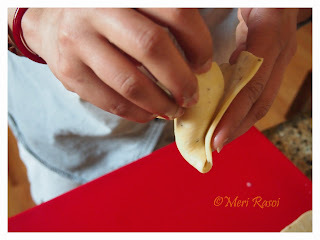 Other names used for this savory pastry are Shinghada, Samsa, sambusa, sambusak, sambosa and chamucha. 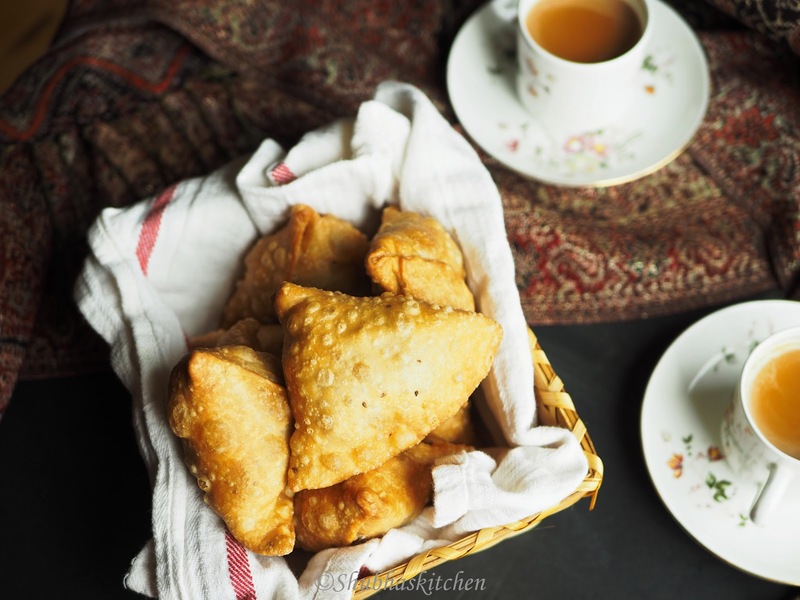 Samosas are said to have originated from Middle East but found its way to the Indian subcontinent in the 13th or 14th century.In India, samosas are usually served vegetarian. The crust is made up from maida or all purpose flour with a texture similar to a pie crust (smooth and flaky) stuffed with a spicy potato filling and then deep fried. 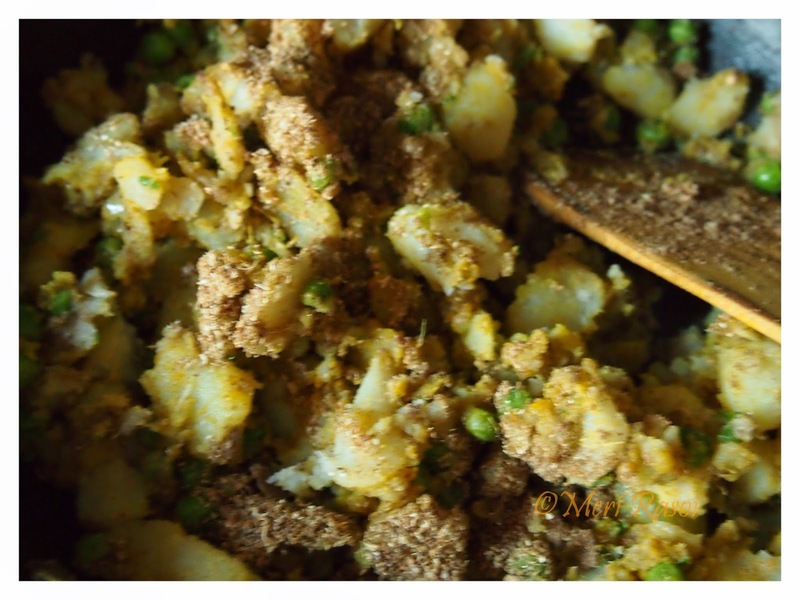 Sometimes, green peas and nuts are also added to the potato filling. For more information about the history and origin, click here. 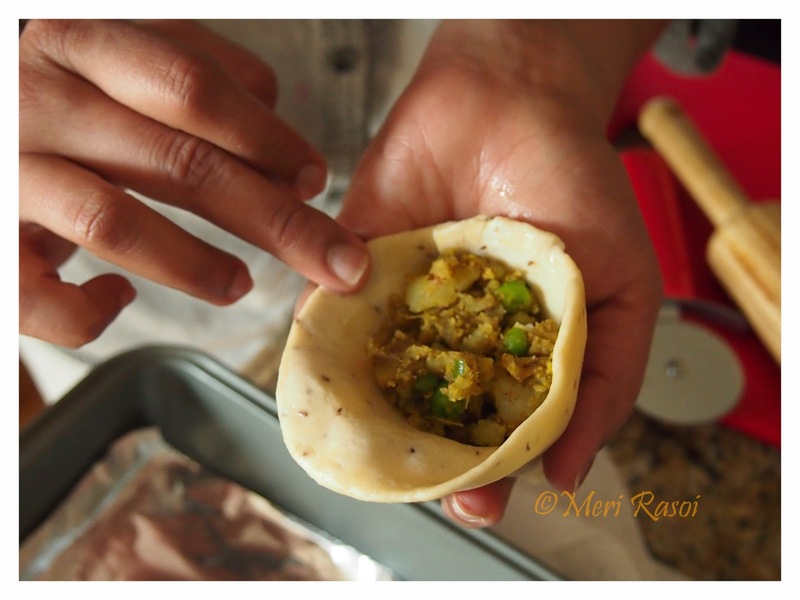 So I guess I have written a lot about Samosa, its time to know how it is prepared..:) Today I will be sharing with you all a recipe of PUNJABI SAMOSA adapted from a recipe by Chef Harpal. 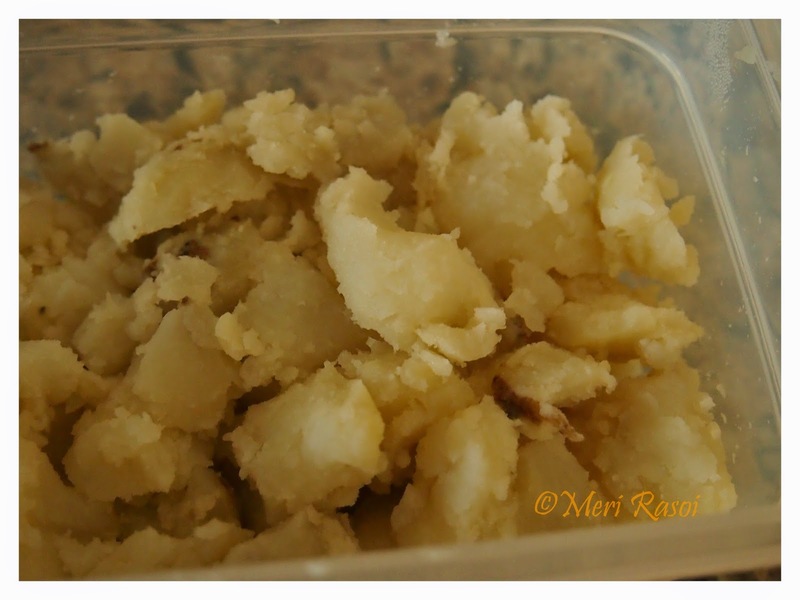 I will be sharing two different ways (1) Deep fried version (2) Baked version. The deep fried version sure tastes better but we loved the baked version too . 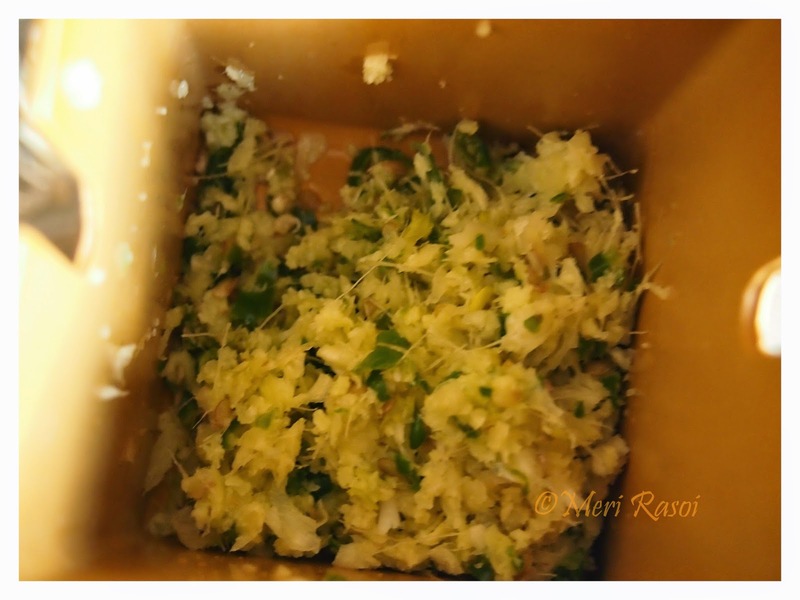 The entire process of making Samosa can be divided into four steps. 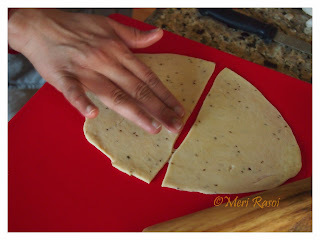 Step 1 would be to prepare the dough for the crust . Step 2 would be to prepare the stuffing. Lastly Step 3 would be shape the samosas and Step 4 would be deep fry or baking them. 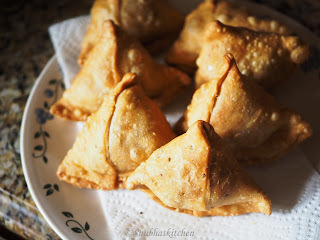 Before I begin with the recipe , kindly go through these points necessary to be kept in mind while preparing the samosas. The amount of fat (ghee / clarified butter) to the flour ratio is very important to get the perfect pastry like texture. 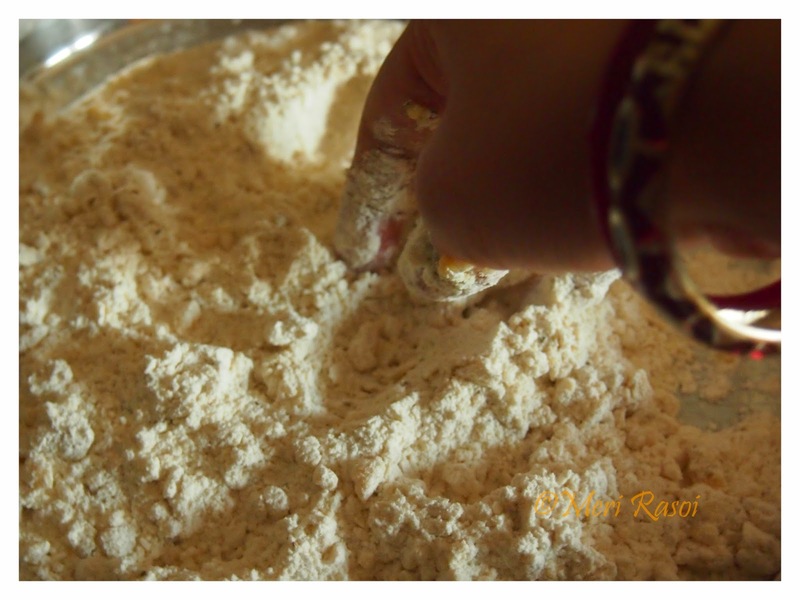 For every part of flour ,you need to use 1/5 the amount of fat. From example, for every 1000 grams of all purpose flour / maida you will need to use 200 grams of ghee / clarified butter. 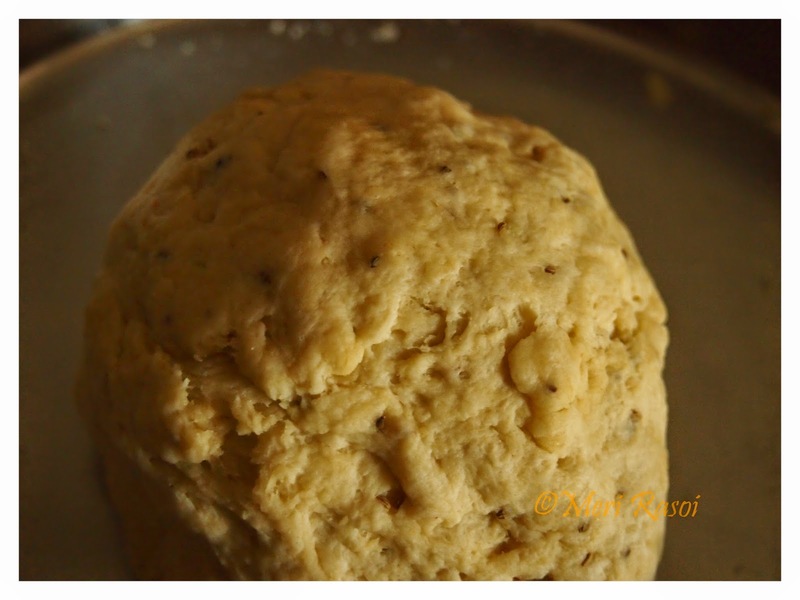 You need to knead a stiff dough (soft but not loose) adding water little by little. A good knead (knead for a good amount of time) is important to get a crisp flaky crust. Also I prefer using cold water to knead the dough. 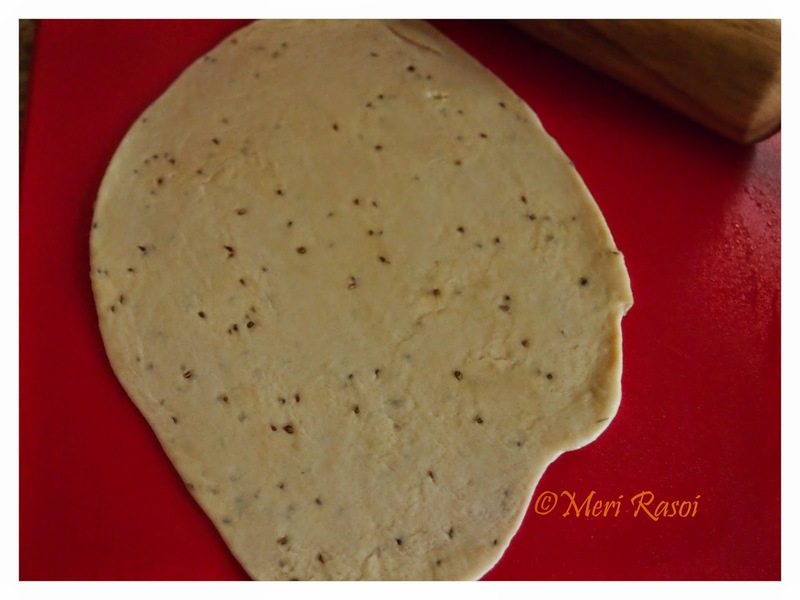 While rolling the dough using the rolling pin, make sure that it is rolled neither too thick nor too thin. The temperature of the oil for deep frying is very crucial. The oil should be medium hot and not too hot. Test the oil before starting the frying process. Add a small piece of the dough in to the oil. 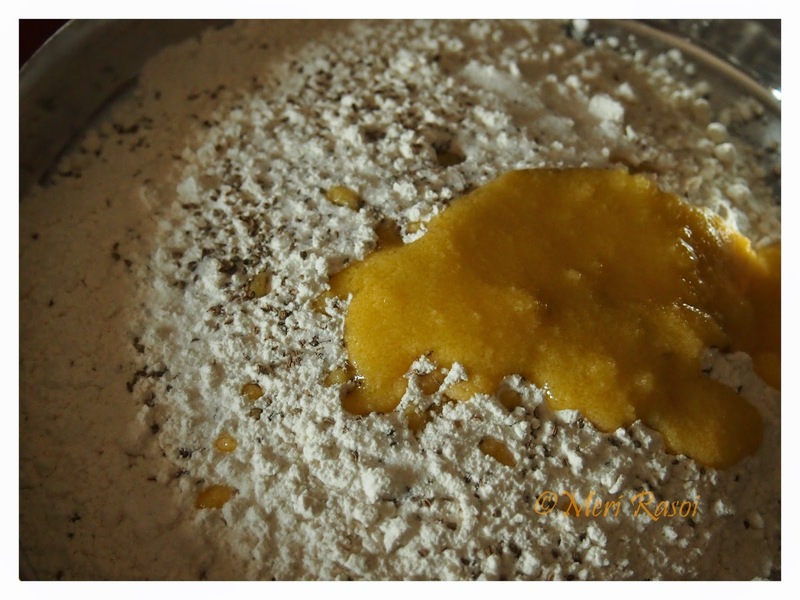 If the oil is just right, the dough will first go to the bottom and then come slowly to the top. 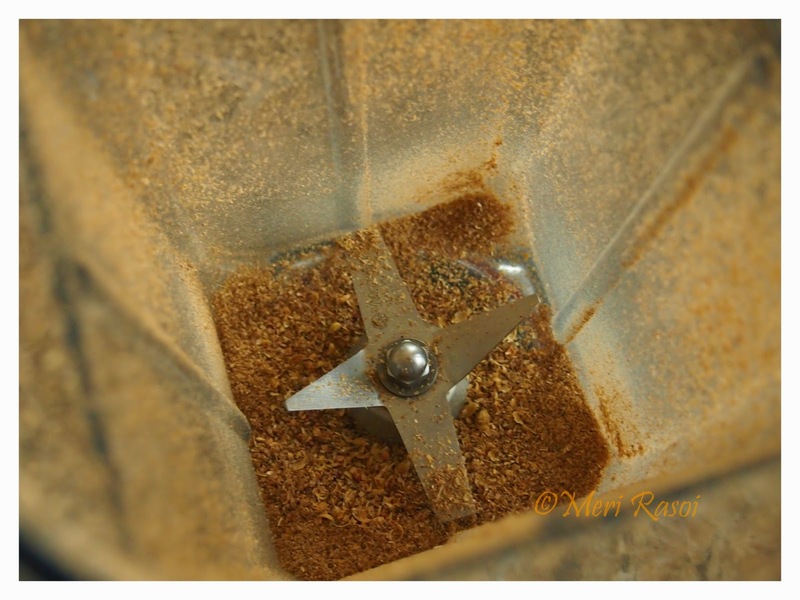 Keeping the above points in mind, let's begin the recipe..
Add salt, ghee , carrom seeds and ghee to the all purpose flour. Using your finger tips, gently rub the ghee against the flour, You should arrive at a texture similar to breadcrumbs. 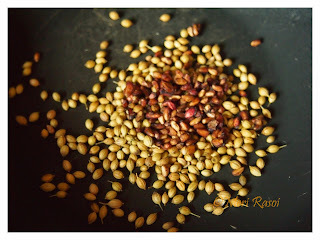 The idea is to get the flour grains coated with the fat component. Add cold water little by little to the flour mixture and form a dough. 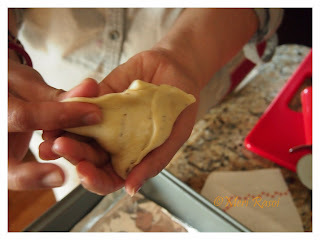 Cover the dough with a moist cloth and let it rest for about 30 minutes. 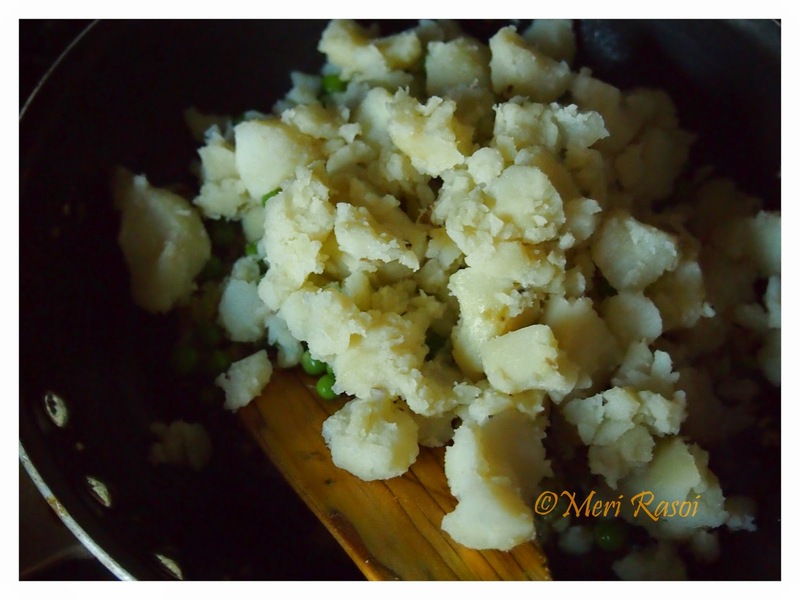 Add the cooked peas to the potato mixture and set it aside. 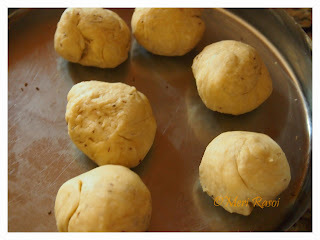 1) Divide the dough in to 6 big balls and keep it covered in moist cloth until ready for use. 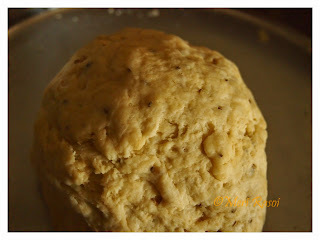 2) Take a ball of dough. 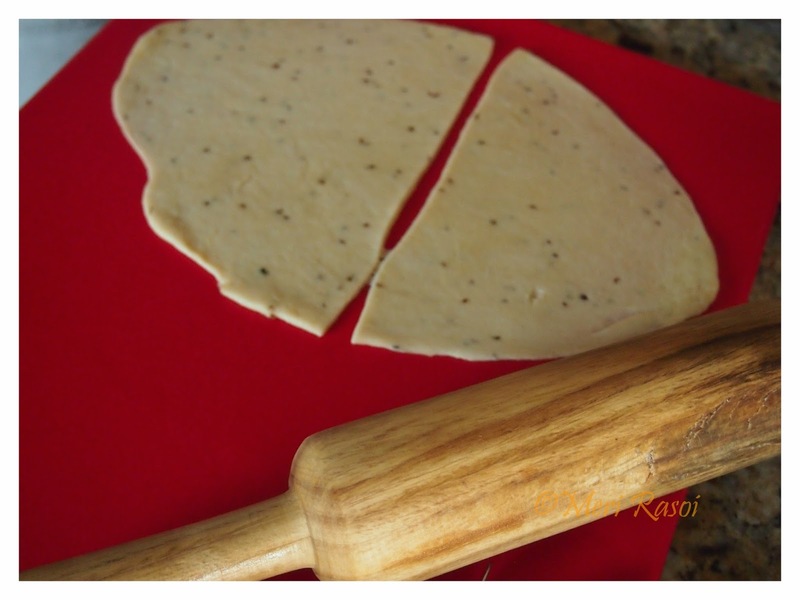 Using a rolling pin, roll it into an oblong shape. The thickness should be neither too thick nor too thin. 3) Using a pizza cutter or a knife , divide the oblong shape in to two parts. 4) Take one half. 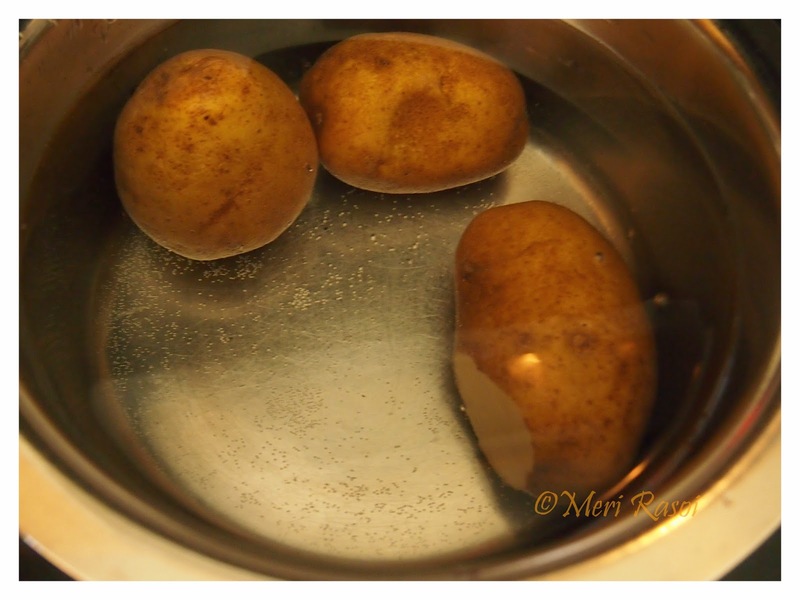 Rub water along the straight edge with fingers or with a pastry brush. 5) Gather the straight edge overlapping by about 1/4 " to form a cone. Press it to form a seal. 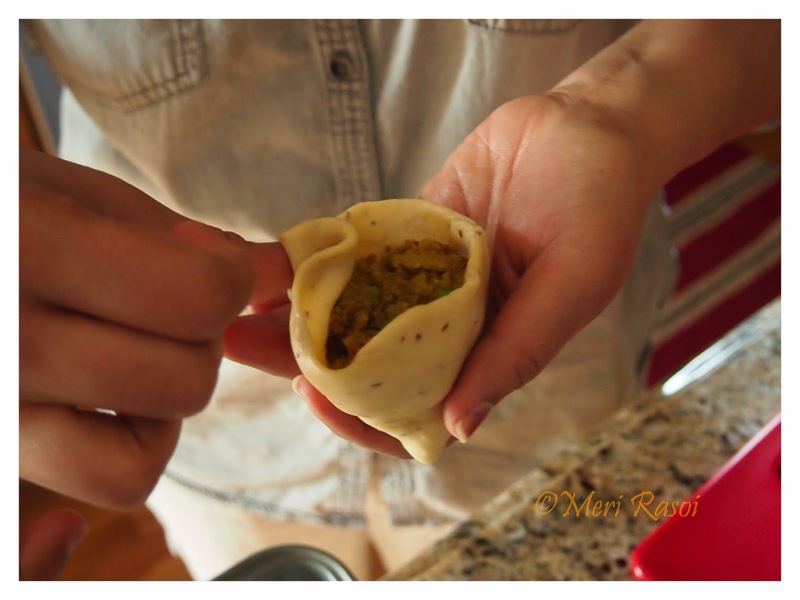 6) Add the stuffing to the prepared cone. 7) Apply water with your finger tips or pastry brush to the outer edge of the cone. 8) Make a tiny fold on the side opposite to the sealed side of the cone (the one we made in step 5). Bring this fold near the previously sealed edge (the one we made in step 5) . Pinch them together. 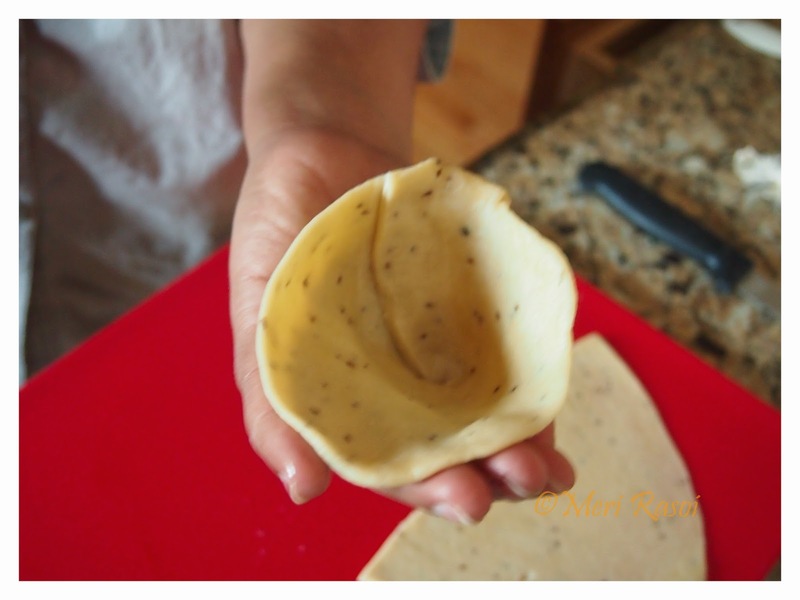 Seal the rest of the outer edge in a similar way. 9) Prepare all the samosas in this way and keep them covered under a moist paper towel. 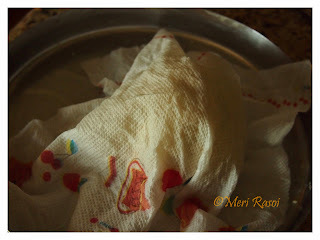 (See to it that the moist paper towel or napkin does not tough the skin of the samosas. If it does, then you will get bubbles in the crust because of the moisture present .The idea is to have a smooth and flaky crust and not a crust with bubbles on the surface). 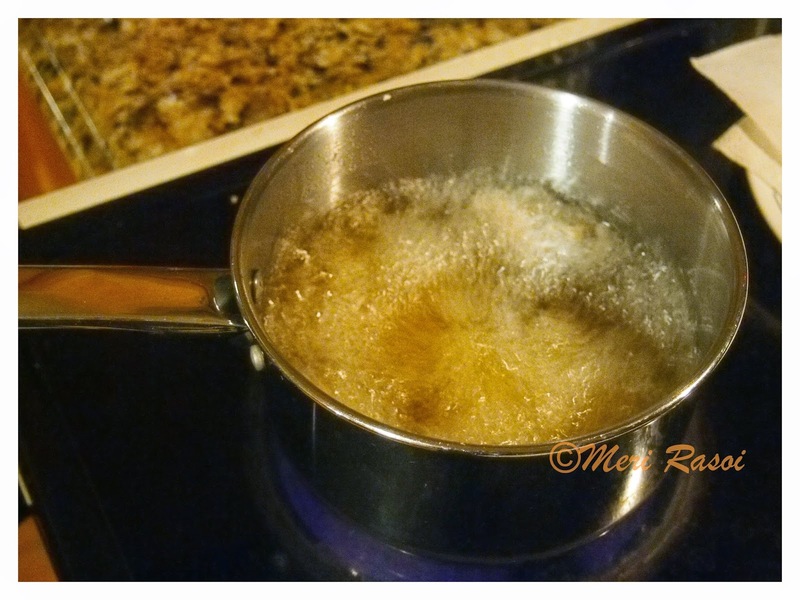 Heat sufficient oil for deep frying. When the oil is hot, deep fry 3-4 of the prepared samosas. Note :We need to fry the samosas in low-medium heat . This ensures even heating through out. 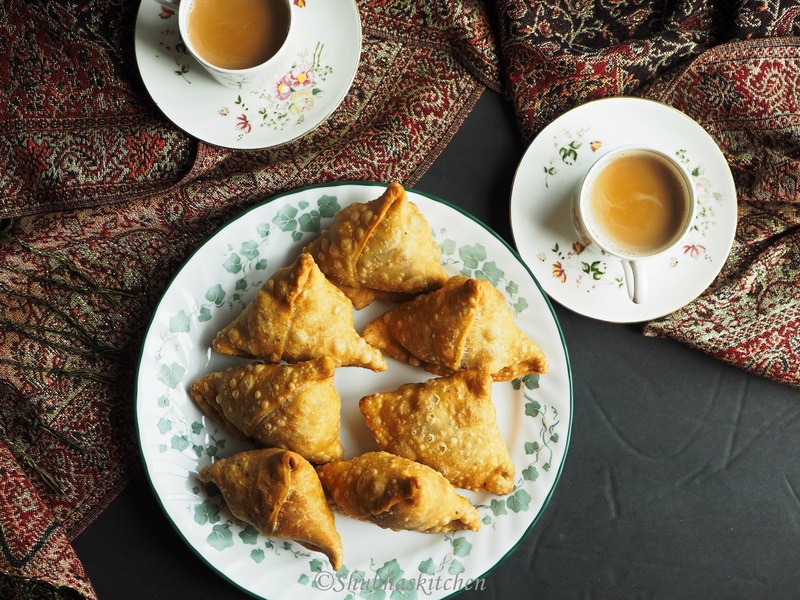 If the oil is too hot, then the outer surface of the samosas will get browned too fast while the inner side will still remain uncooked. 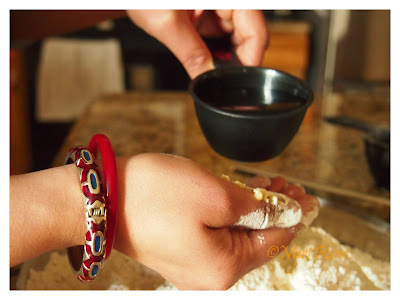 To check the readiness of oil, drop a small piece of dough, if the dough sinks to the bottom and then slowly comes to the surface then the oil is ready to use. 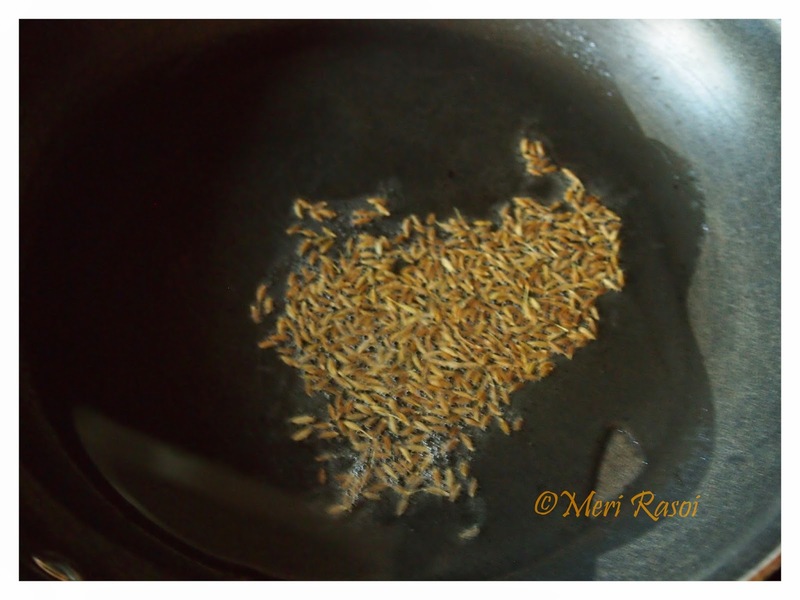 Fry the samosas until they are golden in color. Turn them over in between. 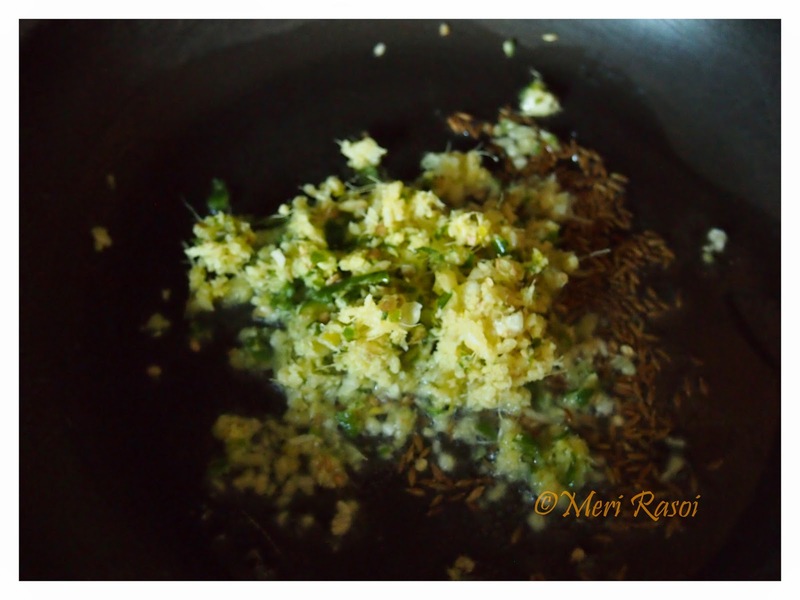 Once done , remove from oil. Drain the excess oil by placing the samosas on an absorbent paper. Serve hot or warm with tomato ketchup or cilantro-mint chutney and tamarind chutney. To bake the samosas, preheat the oven to 350 F (180 c). Assemble the samosas as mentioned above and place them in a baking sheet. 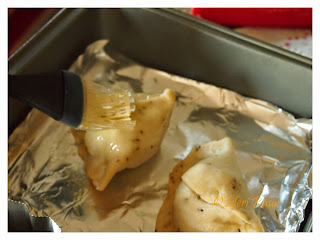 Using pastry brush, brush some oil on the surface of the assembled samosas. 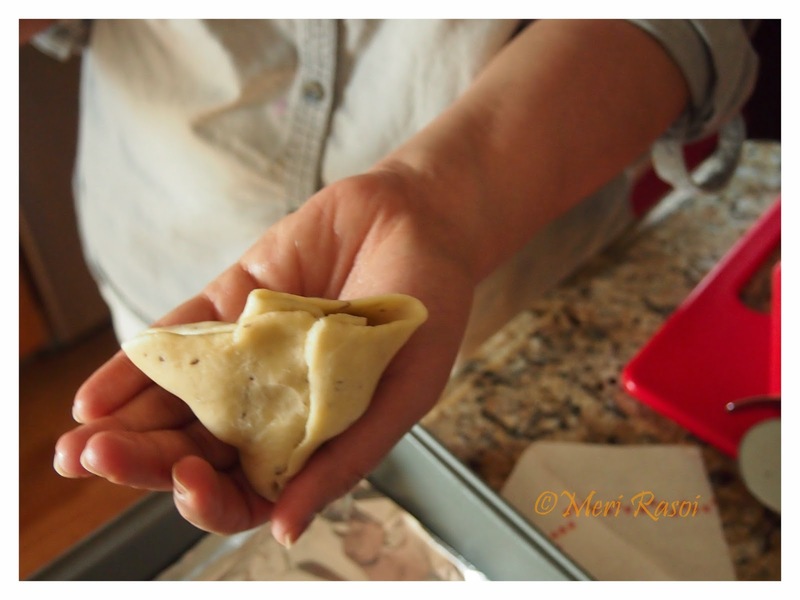 Bake the samosas for about 40 minutes. Half way through, brush some oil on the surface again and turn the samosas to ensure even cooking. Note: The baking temperature varies from oven to oven, so keep an eye. 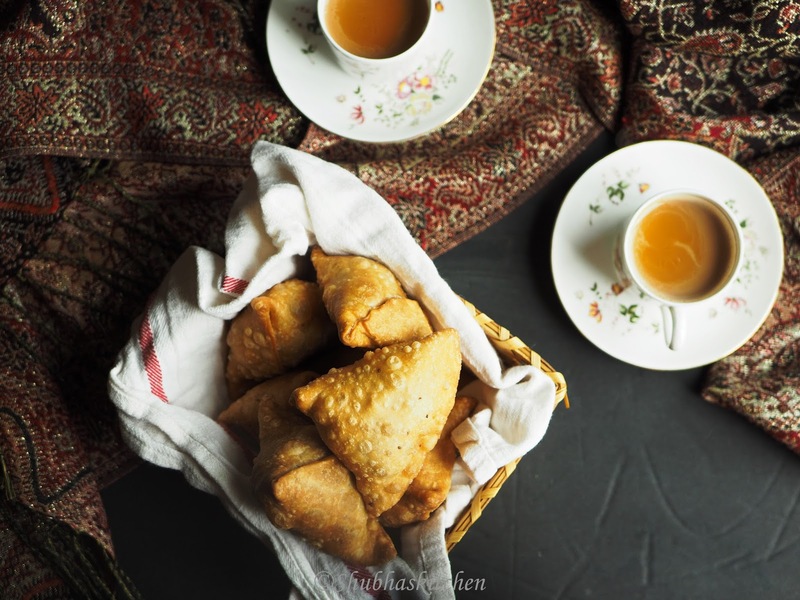 Serve hot or warm samosas with tomato ketchup, or cilantro-mint chutney and tamarind chutney. Super yum. 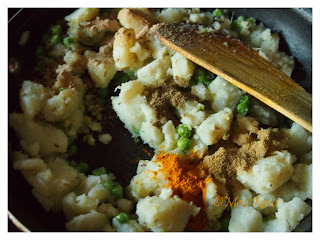 Love the potato filling and the flavoured crust. Sure this samosas would have tasted great..Loved all the pictures..Must try version. Superb work ..and yummy inviting samosas...fried and baked both the version is Great job ..
Amazing samosas! Every picture shows the amount of work that has gone into this. Beautifully explained and clicked. 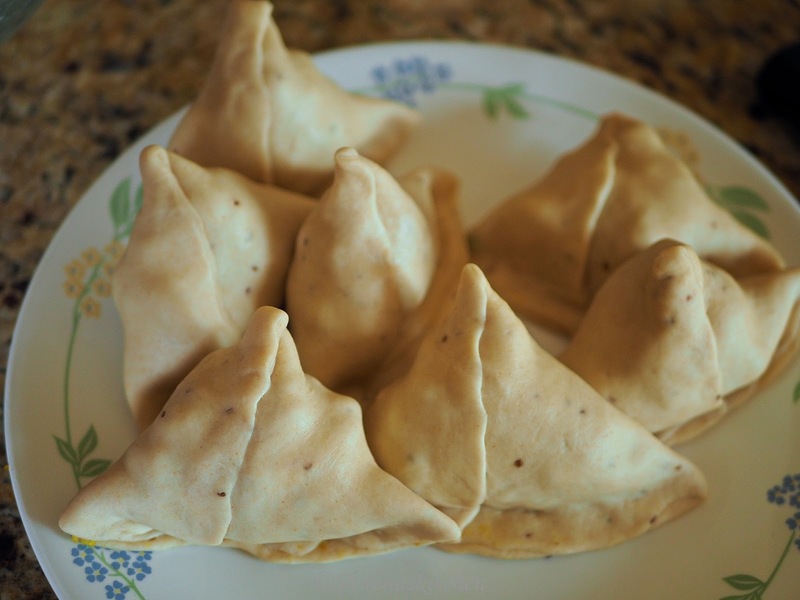 I'm so so tempted to try these well-rounded samosas, with well cooked delicious pastry full of delicious filling. Superb Post! Very elaborative post Shubha, reflects your hard work. Well done! No words ..amazing post with well explanation n nice pics,very determined work..
Lovely lovely recipe and beautifully presented step wise directions! 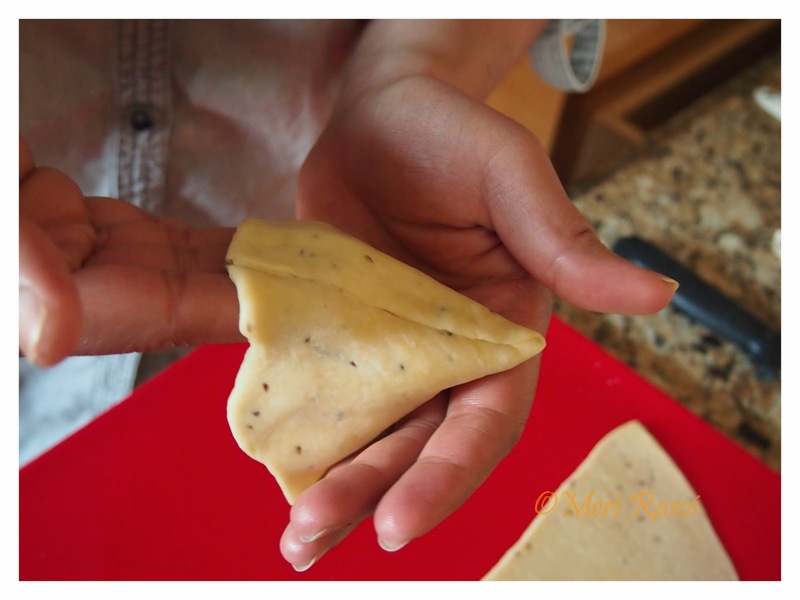 Punjabi samosas are the best! 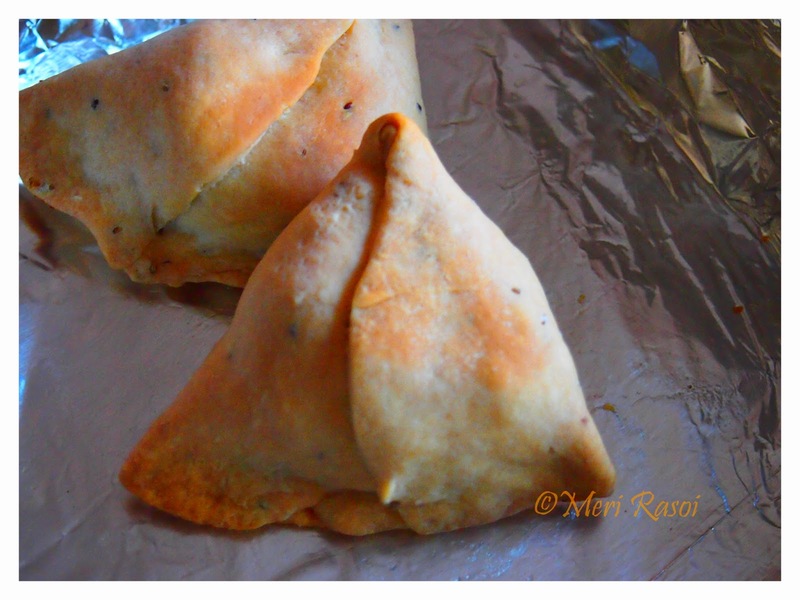 Delicious samosa recipe dear, Very nice presentation. 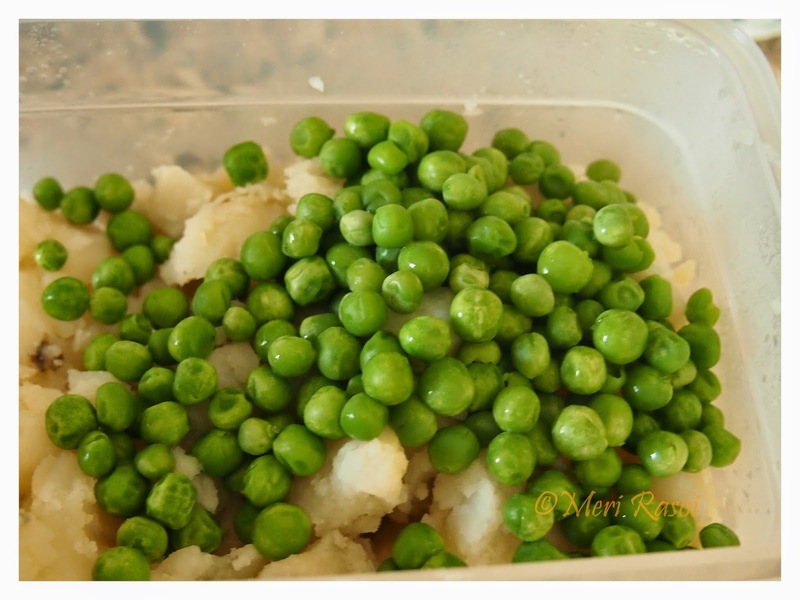 Step by step method has made the process easier to understand. Great work !! wow, super yummmm samosa.... liked the step wise clicks and nice presentation.